It's easy to see why many people think the recruiting process ends with a contract being signed. But the truth is that the recruiting process continues on until new employees are successfully integrated into the company via onboarding. In this article we will explain what onboarding is, how it overlaps with recruiting, and give you four tips for a successful transition. 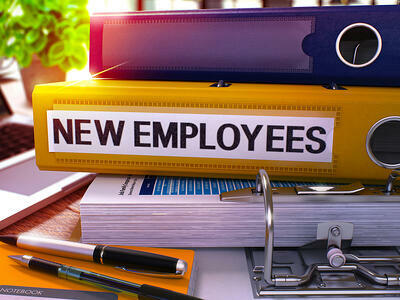 Onboarding is the process of orienting a newly hired employee to their new position, new team, and new work environment. Rather than just encompassing their first day, a successful onboarding process last much longer, even up to a year. There are many elements to the onboarding process, including live demonstrations, online courses, and of course employee introductions. The overall process of onboarding can have a long-term impact on the employee. How does onboarding overlap with the recruiting process? Most people view onboarding as separate from the recruiting process, but really it’s the final step of the candidate journey. You’ve worked so hard to get your best candidate to join the company and you don’t want to lose them in the first few weeks on the job (which happens more often than you might think). It’s important to make sure that your recruiting process and onboarding process are integrated so that candidates can naturally shift into employees. One of the best things you can do to improve this transition is to discuss the onboarding process during the recruiting process. Let the candidate know what your onboarding consists of and what they can expect. Then when they arrive for their first day, they won’t be surprised but rather prepared for the experience. During the recruiting process, the candidate will likely interact with several people in the company. Try to integrate one or several of these people into the candidate's first day, so that they aren’t completely bombarded by new people the whole day. This small touch can help to make the first day seem less overwhelming. Another aspect of the recruiting process that should be addressed during onboarding are the benefits. If you offered certain things to the candidate such as free coffee and tea or membership to a local gym, take the time to show them how they can access these benefits. Check in with them and see if they have any questions or concerns about utilizing their benefits. Just like you use a tool to keep your recruiting process running smoothly, you should also use a tool for onboarding. Blink.it offers a flexible, cost-effective, and sustainable onboarding tool that will help you to create an onboarding program that works best for your company. From the planning process to creating e-learning courses, Blink.it is there for you every step of the way.